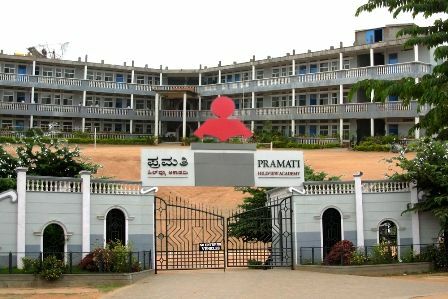 Pramati Hillview Academy is loated in Mysore and provides CBSE & State Syllabus,Day Schooling / Day Boarding / Boarding. Here is a few excerpts about the school. The school is located in the prime residential locality of Kuvempunagar in Mysore city. It is in close proximity to several residential extensions and is well connected with bus facility. The railway station and central bus terminal is 5 kms away from the school. The school is housed in a landmark four storied building housing both the academic and the hostel block. The school campus is well designed and planned by eminent architects to cater to the various needs of the students in an eco friendly atmosphere.